Chennai: Leading television groups in South India, Raj Television Network Ltd, is going to telecast a grand event which was held in Dubai conducted by the Chennai-based Multiplex Group Abirami Mega Mall. The grand event held in Dubai on 26th November has witnessed huge gathering of celebrities from Tamil film Industry. The prestigious Abirami Awards was announced by the Industry Veteran Mr Abirami Ramanathan, the Director of Abirami Mega Mall and he is also in to the business of film Production and Distribution in South India. The Award Night honored some of big names from Kollywood with Abirami Awards that includes Actors Sarathkumar, Jeeva, Music Director Vijay Antony, Directors K.V Anand, Venkat Prabhu, Comedy artist Sathish, Actress Iniyaa, Sangeetha, Lyricist Madhan Kaarki and many others. The cultural event that was part of the award ceremony blasted with scintillating performance of celebrity dancers, singers Vijay prakash, Vel murugan, variety performances and more. Mr.Abirami Ramanath – Director of Abirami Mega Mall facilitated the gathering as Chief Guest. 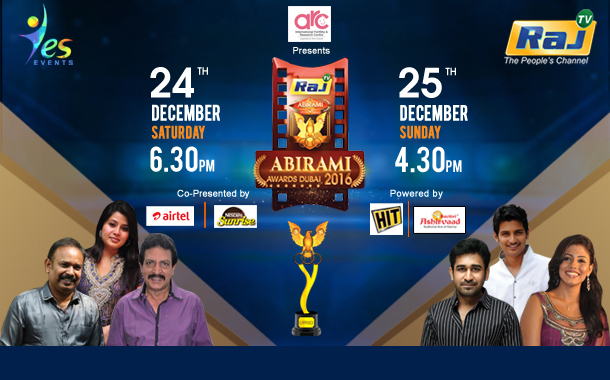 Abirami Awards on Raj TV will be aired on 24th of December 2016 – Saturday @ 6.30 pm and 25th of December 2016 – Sunday @ 4.30 PM. ARC International Fertility & Research Centre, Airtel and Nescafe Sunrise has partnered the event as presenting and co-presenting sponsors, while it was powered by HIT FIK and Savitri Ashirvaad Brand Rice and associated by Sakthi Masala.